Candidates aspiring to membership in the religious orders underwent severe tests to prove their worthiness. These ordeals were called initiations. Those who passed them successfully were welcomed asbrothers by the priests and were instructed in the secret teachings. Among the ancients, philosophy, science, and religion were never considered as separate units: each was regarded as an integral part of the whole. Philosophy was scientific and religious; science was philosophic and religious I religion was philosophic and scientific. Perfect wisdom was considered unattainable save as the result of harmonizing all three of these expressions of mental and moral activity. During the Middle Ages the long-ignored axioms and formulæ of Hermetic wisdom were assembled once more, and chronicled, and systematic attempts were made to test their accuracy. To Theophrastus of Hohenheim, who called himself Paracelsus (a name meaning “greater than Celsus”), the world is indebted for much of the knowledge it now possesses of the ancient systems of medicine. Paracelsus devoted his entire life to the study and exposition of Hermetic philosophy. Every notion and theory was grist to his mill, and, while members of the medical fraternity belittle his memory now as they opposed his system then, the occult world knows that he will yet be recognized as the greatest physician of all times. While the heterodox and exotic temperament of Paracelsus has been held against him by his enemies, and his wanderlust has been called vagabondage, he was one of the few minds who intelligently sought to reconcile the art of healing with the philosophic and religious systems of paganism and Christianity. Paracelsus was a great observationalist, and those who knew him best have called him “The Second Hermes” and “The Trismegistus of Switzerland.” He traveled Europe from end to end, and may have penetrated Eastern lands while running down superstitions and ferreting out supposedly lost doctrines. From the gypsies he learned much concerning the uses of simples, and apparently from the Arabians concerning the making of talismans and the influences of the heavenly bodies. Paracelsus felt that the healing of the sick was of far greater importance than the maintaining of an orthodox medical standing, so he sacrificed what might otherwise have been a dignified medical career and at the cost of lifelong persecution bitterly attacked the therapeutic systems of his day. Uppermost in his mind was the hypothesis that everything in the universe is good for something–which accounts for his cutting fungus from tombstones and collecting dew on glass plates at midnight. He was a true explorer of Nature’s arcanum. 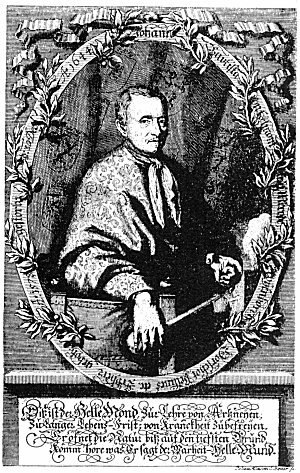 Many authorities have held the opinion that he was the discoverer of mesmerism, and that Mesmer evolved the art as the result of studying the writings of this great Swiss physician. The belief that nearly all diseases have their origin in the invisible nature of man (the Astrum) is a fundamental precept of Hermetic medicine, for while Hermetists in no way disregarded the physical body, they believed that man’s material constitution was an emanation from, or an objectification of, his invisible spiritual principles. A brief, but it is believed fairly comprehensive, résumé of the Hermetic principles of Paracelsus follows. THE TITLE PAGE OF THE BOOK OF ALZE. 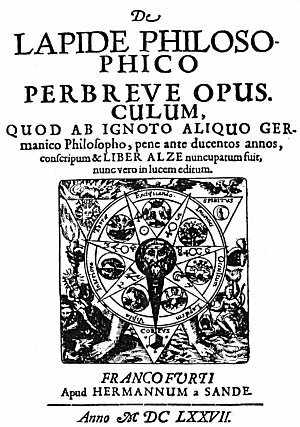 This title page is a further example of Hermetic and alchemical symbolism. The seven-pointed star of the sacred metals is arranged that one black point is downward, thus symbolizing Saturn, the Destroyer. Beginning in the space immediately to the left of the black point, reading clockwise discloses the cryptic word VITRIOL formed by the capital letters of the seven Latin words in the outer circle. This vital energy has its origin in the spiritual body of the earth. Every created thing has two bodies, one visible and substantial, the other invisible and transcendent. The latter consists of an ethereal counterpart of the physical form; it constitutes the vehicle of archæus, and may be called a vital body. This etheric shadow sheath is not dissipated by death, but remains until the physical form is entirely disintegrated. These “etheric doubles, “seen around graveyards, have given rise to a belief in ghosts. Being much finer in its substances than the earthly body, the etheric double is far more susceptible to impulses and inharmonies. It is derangements of this astral light body that cause much disease. Paracelsus taught that a person with a morbid mental attitude could poison his own etheric nature, and this infection, diverting the natural flow of vital life force, would later appear as a physical ailment. 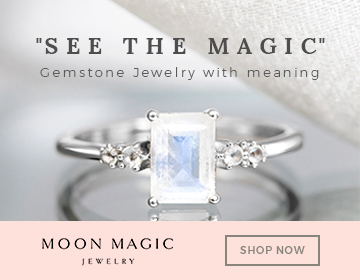 All plants and minerals have an invisible nature composed of this “archæus,” but each manifests it in a different way. The control of universal energy is virtually impossible, save through one of its vehicles (the mumia). A good example of this is food. Man does not secure nourishment from dead animal or plant organisms, but when he incorporates their structures into his own body he first gains control over the mumia, or etheric double, of the animal or plant. Having obtained this control, the human organism then diverts the flow of the archæus to its own uses. Paracelsus says: “That which constitutes life is contained in the Mumia, and by imparting the Mumia we impart life.” This is the secret of the remedial properties of talismans and amulets, for the mumia of the substances of which they are composed serves as a channel to connect the person wearing them with certain manifestations of the universal vital life force. From von Helmont’s Ausgang der Artznen-Kunst. Von Helmont is only one of many who have accidentally hit upon the secrets of the early priestcrafts, but none in this age give evidence of an adequate comprehension of the ancient Hermetic secrets. From the description von Helmont gives, it is probable that the herb mentioned by him paralyzed temporarily the cerebrospinal nervous system, the result being that the consciousness was forced to function through the sympathetic nervous system and its brain–the solar plexus. mental and physical subnormality. The third was an unhealthy or abnormal mental attitude. Melancholia, morbid emotions, excess of feeling, such as passions, lusts, greeds, and hates, affected the mumia, from which they reacted into the physical body, where they resulted in ulcers, tumors, cancers, fevers, and tuberculosis. The ancients viewed the disease germ as a unit of mumia which had been impregnated with the emanations from evil influences which it had contacted. In other words, germs were minute creatures born out of man’s evil thoughts and actions. The fourth cause of disease was what the Orientals called Karma, that is, the Law of Compensation, which demanded that the individual pay in full for the indiscretions and delinquencies of the past. A physician had to be very careful how he interfered with the workings of this law, lest he thwart the plan of Eternal justice. The fifth cause was the motion and aspects of the heavenly bodies. The stars did not compel the sickness but rather impelled it. The Hermetists taught that a strong and wise man ruled his stars, but that a negative, weak person was ruled by them. These five causes of disease are all superphysical in nature. They must be estimated by inductive and deductive reasoning and a careful consideration of the life and temperament of the patient. According to the Hermetists, disease could be prevented or successfully combated in seven ways. First, by spells and invocations, in which the physician ordered the evil spirit causing the disease to depart from the patient. This procedure was probably based on the Biblical account of the man possessed of devils whom Jesus healed by commanding the devils to leave the man and enter into a herd of swine. Sometimes the evil spirits entered a patient at the bidding of someone desiring to injure him. In these cases the physician commanded the spirits to return to the one who sent them. It is recorded that in some instances the evil spirits departed through the mouth in the form of clouds of smoke; sometimes from the nostrils as flames. It is even averred that the spirits might depart in the form of birds and insects. The sixth method–which was prevention rather than cure–was regulation of the diet and daily habits of life. The individual, by avoiding the things which caused illness, remained well. The ancients believed that health was the normal state of man; disease was the result of man’s disregard of the dictates of Nature. The seventh method was “practical medicine,” consisting chiefly of bleeding, purging, and similar lines of treatment. These procedures, while useful in moderation, were dangerous in excess. Many a useful citizen has died twenty-five or fifty years before his time as the result of drastic purging or of having all the blood drained out of his body. Many primitive peoples used herbal remedies, with many remarkable cures. The Chinese, Egyptians, and American Indians cured with herbs diseases for which modern science knows no remedy. 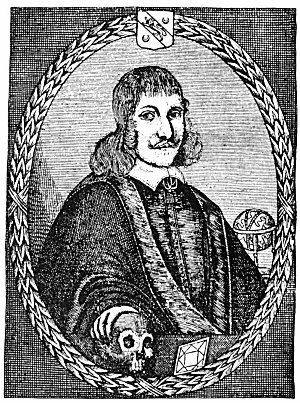 Doctor Nicholas Culpeper, whose useful life ended in 1654, was probably the most famous of herbalists. Finding that the medical systems of his day were unsatisfactory in the extreme, Culpeper turned his attention to the plants of the fields, and discovered a medium of healing which gained for him national renown. Mediæval European herbalists rediscovered only in part the ancient Hermetic secrets of Egypt and Greece. These earlier nations evolved the fundamentals of nearly all modern arcs and sciences. This famous physician, herbalist, and astrologer spent the greater part of his useful life ranging the hills and forests of England and cataloguing literally hundreds of medicinal herbs. Condemning the unnatural methods of contemporaneous medicos, Culpeper wrote: “This not being pleasing, and less profitable tome, I consulted with my two brothers, DR. REASON and DR. EXPERIENCE, and took a voyage to visit my mother NATURE, by whose advice, together with the help of Dr. DILIGENCE, I at last obtained my desire; and, being warned by MR. HONESTY, a stranger in our days, to publish it to the world, I have done it.” (From the Introduction to the 1835 Edition of The Complete Herbal.) Doctor Johnson said of Culpeper that he merited the gratitude of posterity. [paragraph continues] At that time the methods used in healing were among the secrets imparted to initiates of the Mysteries. Unctions, collyria, philters, and potions were concocted to the accompaniment of strange rites. The effectiveness of these medicines is a matter of historical record. Incenses and perfumes were also much used. Poisons were thoroughly studied, and in some communities extracts of deadly herbs were administered to persons sentenced to death–as in the case of Socrates. The infamous Borgias of Italy developed the art of poisoning to its highest degree. Unnumbered brilliant men and women were quietly and efficiently disposed of by the almost superhuman knowledge of chemistry which for many centuries was preserved in the Borgia family. Egyptian priests discovered herb extracts by means of which temporary clairvoyance could be induced, and they made use of these during the initiatory rituals of their Mysteries. The drugs were sometimes mixed with the food given to candidates, and at other times were presented in the form of sacred potions, the nature of which was explained. Shortly after the drugs were administered to him, the neophyte was attacked by a spell of dizziness. He found himself floating through space, and while his physical body was absolutely insensible (being guarded by priests that no ill should befall it) the candidate passed through a number of weird experiences, which he was able to relate after regaining consciousness. In the light of present-day knowledge, it is difficult to appreciate an art so highly developed that by means of draughts, perfumes, and incenses any mental attitude desired could be induced almost instantaneously, yet such an art actually existed among the priestcraft of the early pagan world. Herbal compounds were used to cause temporary clairvoyance in connection with the oracles, especially the one at Delphi. Words spoken while in these imposed trances were regarded as prophetic. Modem mediums, while under control as the result of partly self-imposed catalepsy, give messages somewhat similar to those of the ancient prophets, but in the majority of cases their results are far less accurate, for the soothsayers of today lack the knowledge of Nature’s hidden forces. The Mysteries taught that during the higher degrees of initiation the gods themselves took part in the instruction of candidates or at least were present, which was in itself a benediction. As the deities dwelt in the invisible worlds and came only in their spiritual bodies, it was impossible for the neophyte to cognize them without the assistance of drugs which stimulated the clairvoyant center of his consciousness (probably the pineal gland). Many initiates in the ancient Mysteries stated emphatically that they had conversed with the immortals, and had beheld the gods. When the standards of the pagans became corrupted, a division took place in the Mysteries. The band of truly enlightened ones separated themselves from the rest and, preserving the most important of their secrets, vanished without leaving a trace. The rest slowly drifted, like rudderless ships, on the rocks of degeneracy and disintegration. Some of the less important of the secret formulæ fell into the hands of the profane, who perverted them–as in the case of the Bacchanalia, during which drugs were mixed with wine and became the real cause of the orgies. In certain parts of the earth it was maintained that there were natural wells, springs, or fountains, in which the water (because of the minerals through which it coursed) was tinctured with sacred properties. Temples were often built near these spots, and in some cases natural caves which chanced to be in the vicinity were sanctified to some deity. “The aspirants to initiation, and those who came to request prophetic dreams of the Gods, were prepared by a fast, more or less prolonged, after which they partook of meals expressly prepared; and also of mysterious drinks, such as the water of Lethe, and the water of Mnemosyne in the grotto of Trophonius; or of the Ciceion in the mysteries of the Eleusinia. Different drugs were easily mixed up with the meats or introduced into the drinks, according to the state of mind or body into which it was necessary to throw the recipient, and the nature of the visions he was desirous of procuring.” (Salverte’s The Occult Sciences.) The same author states that certain sects of early Christianity were accused of using drugs for the same general purposes as the pagans. The sect of the Assassins, or the Yezidees as they are more generally known, demonstrated a rather interesting aspect of the drug problem. In the eleventh century this order, by capturing the fortress of Mount Alamont, established itself at Irak. Hassan Sabbah, the founder of the order, known as the “Old Man of the Mountain, ” is suspected of having controlled his followers by the use of narcotics. Hassan made his followers believe that they were in Paradise, where they would be forever if they implicitly obeyed him while they were alive. De Quincey, in his Confessions of an Opium Eater, describes the peculiar psychological effects produced by this product of the poppy, and the use of a similar drug may have given rise to the idea of Paradise which filled the minds of the Yezidees. Disease is unnatural, and is evidence that there is a maladjustment within or between organs or tissues. Permanent health cannot be regained until harmony is restored. The outstanding virtue of Hermetic medicine was its recognition of spiritual and psychophysical derangements as being largely responsible for the condition which is called physical disease. Suggestive therapy was used with marked success by the priest-physicians of the ancient world. Among the-American Indians, the Shamans–or “Medicine Men”–dispelled sickness with the aid of mysterious dances, invocations, and charms. The fact that in spite of their ignorance of modern methods of medical treatment these sorcerers effected innumerable cures, is well worthy of consideration. The magic rituals used by the Egyptian priests for the curing of disease were based upon a highly developed comprehension of the complex workings of the human mind and its reactions upon the physical constitution. The Egyptian and Brahmin worlds undoubtedly understood the fundamental principle of vibrotherapeutics. By means of chants and mantras, which emphasized certain vowel and consonant sounds, they set up vibratory reactions which dispelled congestions and assisted Nature in reconstructing broken members and depleted organisms. They also applied their knowledge of the laws governing vibration to the spiritual constitution of man; by their intonings, they stimulated latent centers of consciousness and thereby vastly increased the sensitiveness of the subjective nature. In the Book of Coming Forth by Day, many of the Egyptian secrets have been preserved to this generation. While this ancient scroll has been well translated, only a few understand the secret: significance of its magical passages. Oriental races have a keen realization of the dynamics of sound. They know that every spoken word has tremendous power and that by certain arrangements of words they can create vortices of force in the invisible universe about them and thereby profoundly influence physical substance. The Sacred Word by which the world was established, the Lost Word which Masonry is still seeking, and the threefold Divine Name symbolized by A. U. M.–the creative tone of the Hindus–all are indicative of the veneration accorded the principle of sound. The so-called “new discoveries” of modern science are often only rediscoveries of secrets well known to the priests and philosophers of ancient pagandom. Man’s inhumanity to man has resulted in the loss of records and formula: which, had they been preserved, would have solved many of the greatest problems of this civilization. With sword and firebrand, races obliterate the records of their predecessors, and then inevitably meet with an untimely fate for need of the very wisdom they have destroyed. From De Monte-Snyders’ Metamorphosis Planetarum.